Retirement has proven to be little respite for living NBA legends Karl Malone and Chris Webber, and former NFL starsBarry Sanders and Ladainian Tomlinson, who are reminded of their ring-less professional careers in the new spot from Foot Locker, “No Rings”. 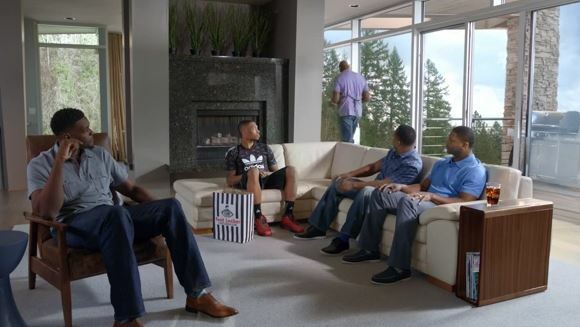 Airing today and throughout the start of playoff action, the new commercial features Portland Trail Blazers’ Damian Lillard on his phone talking about how he hopes not to end up ringless like some athletes of the past. To his surprise, iconic (and ringless) sports legends Sanders, Tomlinson, Webber, and Malone are hanging out in his living room, noticeably affected by the reminder that the coveted championship ring has slipped through their fingers. Foot Locker’s new commercial is part of Foot Locker’s successful “Approved” marketing platform and can be seen here. The spot features the newest performance footwear from Adidas basketball, including the Lillard Edition Crazy 1, Crazy 8 and D Rose 4.5, as well as the latest apparel styles from Adidas Originals.